A wide range of products developed exclusively for you and your clients. OXD is a brand of cosmetic products adressed to athletes and all professionals of physiotherapy and sports medicine. If you are a physiotherapist, at this site you will find a wide range of products designed and developed to meet the needs of your customers and your own, specially taking care of aspects such as the elasticity and the slide of products, the protection of your customer’s skin and yours as well or the variety of formats. The OXD professional range is dynamic and in constant evolution according to the needs of the sector. It is your faithful ally, it accompanies you every session and sums the quality and effectiveness of the OXD products to your therapeutic knowledge. 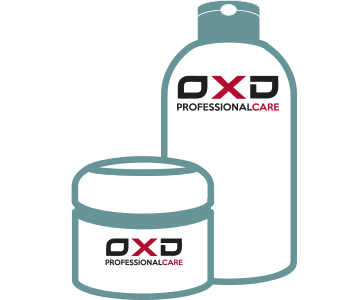 OXD started as a muscular brand of creams and gels for sports massage. However, thanks to the knowledge and experience that provides being part of Telic Group, it has expanded its catalogue through the integration of + B.O products and currently OXD can offer a wide range of creams and massage oils, essential oils, products for cryotherapy and thermotherapy or treatment products based on natural ingredients.